Is there anything cuter than a cat in a box? 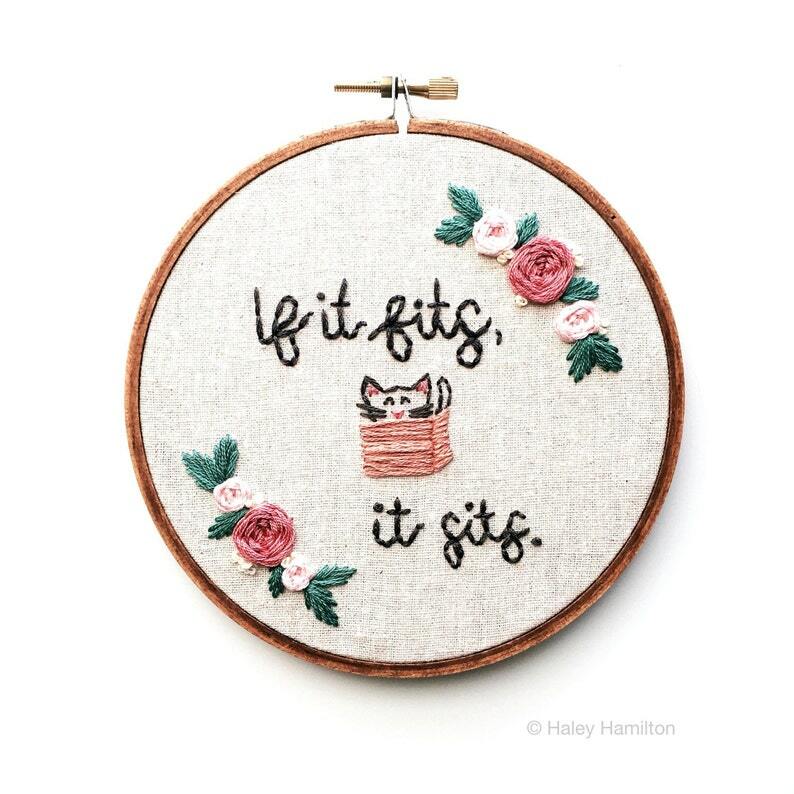 This funny embroidery for cat lovers is finished in a hoop and comes ready-to-hang. The fabric is stretched and secured to the back of the wooden hoop, which has been stained to enhance the natural color of the wood. Once you find the perfect place for this hoop in your home, hang it on a wall as-is or tie a ribbon around the top, prop it up on a table, or place the hoop in a small picture frame stand. Because each piece is handmade and completely unique, there may be slight variations in stitching from the photo. All of my designs are original and drawn by hand, which sets my embroidery apart and adds a higher level of quality to each finished hoop. I am a highly-detailed individual, and put in the extra time and additional care to ensure each stitch is perfectly placed for a beautiful result. I hope you enjoy this embroidered piece! This hoop is absolutely adorable! I felt like the shipping took a minute, but it was completely worth it when I took it out of the box. It was sweetly wrapped with a handwritten thank you card, which genuinely makes you feel special, and it shows that the hoop was made with love~ it's a gift for my sister, but I'm tempted to keep it for myself...! Just perfect! Absolutely beautiful and packaged so well. I'm very happy with it. Makes me smile! Haley...absolutely LOVE it. Definitely a kitty thing. Hope to be able to purchase another for my niece who stands a grand 4’11” tall and often claims “if I fit...”. 😆 The extra attention to packaging was adorable. Thanks so much. Linda.